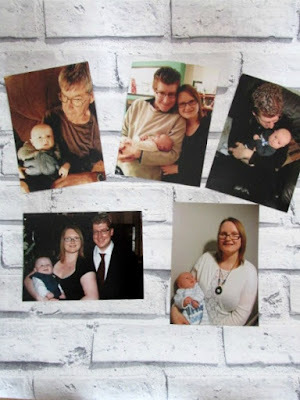 Snapfish recently contacted me to ask if I wanted to review some items for Fathers Day (19th June) as I love personalised Items I had to say yes. Next was the hard decision of what to choose as they have such a varied selection of items. I chose to get some prints that we could frame, some personalsied cards and x6 photo coasters. Now one of the issues I have constantly with Snapfish is all my photos coming up as low resolution so I felt restricted on what items to choose as I didn't want them to come out blurry. I don't know if anyone else has had this issue at all? I use photos from my camera which is why it confuses me as could understand with photos taken from a mobile phone. So the prints we chose were a selection of me with Blake, Stuart with Blake and Blake with his Grandad and the three of us as a family. 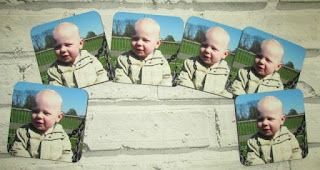 We went for the 7x5 matt prints which are 19p each. Even though the website was saying that the photos were low quality I still feel that they came out well. We currently have one of the 3 of us in a frame on the mantle piece. We are also going to get some frames for the others and have 3 hanging up around the home and the one of Blake with his Grandad is going to be a gift for my Father in law. Next up are some personalised Fathers Day cards for both Stuart and my Father in law. They are of excellent quality and the photos have come out well. 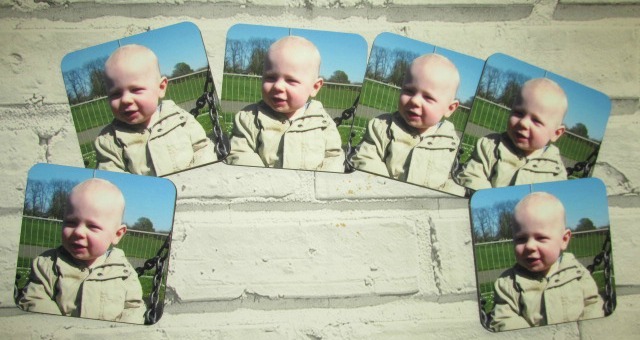 Cards on Snapfish start at 75p which is a great price for personalised, high quality cards. I know that both Stuart and my Father in law are going to love them. Last of all is the set of 6 personalised coasters for £12.99 They are 4x4 in size and are also excellent quality like the other items. One thing that surpirsed me was that the photo I used was taken on my mobile and came out fine but images coming from my camera came up as low quality when trying to order. I do love this photo of Blake though playing at the park and love the blue skys in the background. One thing I would have liked with the coasters would be that it would be nice to have an option of not just one photo for all 6 coasters but being able to select up to 6 photos to include on them. Have you purchased anything from Snapfish recently? I've never purchased anything from Snapfosh, so thank you for the review. Did you figure out the resolution issue? I have never heard of Snapfish before but I think the cards you ordered are pretty cute. Regarding the quality of the pictures, maybe there was a hidden setting that resized the pictures and that's why they came out blurry? I need to start planning Father's Day. Thank you for reminding me and sharing a lovely company. I love a bit of photo fun. I struggled using snapfish on my mac but i need to get round that! I haven't purchased from Snapfish recently but when I did last the prints came out OK. Lovely gifts! So cute. Perfect for Father's Day. I think personalised items with your children/grandchildren on make amazing presents. So much choice these days and as so many of us just snap snap snap away then there are always a wide choice of pictures to use. 75p for a card is a good price, and for a personalised card is an amazing price. Hope both the recipients like their cards when they get them. Shame you feel some of them come out a low resolution when you know it was a good quality picture. Maybe something to do with the way the picture uploads? I have used snapfish before and the photos came out ok but a few of them were low res. A great fathers day gift nevertheless. We're massive fans of Snapfish and are always on the look out for their fab discount codes online. Perfect for Christmas! Might try ordering in time for Fathers Day! I love the coasters what a brlliant idea and very cute! I love personalised gifts and I know my family love receiving them from the boys. This is so beautiful i think we do give enough credit to our fathers. I think my father would love something like this, will try to order it hopefully will come on time.